Durga Puja 2007 is behind us now. It is time now for wishing “Subho Bijoya”, “Kolakuli” and of course “Mishti mukh”. Durga Puja in New York, New Jersey have now matured to such an extent that people can say things like – “during our times” or “in those days” – just to signify that times have changed. Yes times have changed indeed, even though the Durga idol has not changed that much over the years. 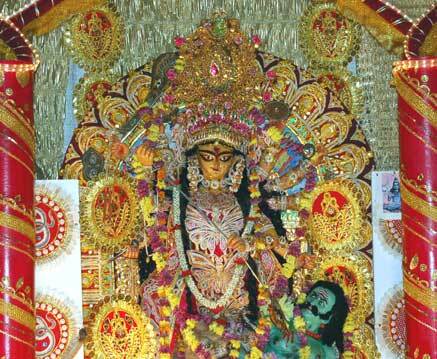 I hear people complaining that the Puja’s here have lost the intimate and homely feeling that it used to offer and have now become the real “Baroari Pujas” where people come to have fun, enjoy the entertainment programs and meet friends with an occasional nod at the idol. Managing crowd is a major problem for the organizers and some are thinking about moving to larger venues. The following Bengali vocal music program by Subhomita was an excellent presentation. Subhomita is undoubtedly one of the leading singers of Bengali modern songs. Her vocal range and purity of notes was mesmerizing. She also maintains a distinction by mostly singing her own songs rather than the old and popular cover numbers. She had an excellent accompaniment (and not pre-recorded audio tracks) which included her husband on the tabla as well as the popular percussionist of ETV Bangla music shows – Ratan Chakraborty on the octopad. The highlight of Sunday evening’s program was the children’s play “The Emperor’s New Groove” based on the popular Disney animation film, adapted and directed by Aparajita Das. The colorful presentation rocked with jazzy dance numbers where the cute kids of Kallol danced to feet tapping Latino music. This play too started off with some audio problems, but this time the play was interrupted and the problem fixed. The kids too were very careful to ensure that whatever they said was heard loud and clear. In one instance the lapel microphone came off one of the actor’s costume, but he smartly picked it up and held the mic close to his mouth before delivering his dialog. I guess the “Shahjahan” incident taught them a lesson. The following event, Satinath Mukhopadhyay’s recitation, was able to keep the audience on their seats on a Sunday evening. He proved that he knew the skills of using the microphone and controlling his voice to deliver the right emotions. Tejendra Narayan Majumdar’s sarod recital concluded Kallol’s puja event for 2007 in the traditional way. Tejendra was accompanied on the tabla by the talented young Anubrata Chatterjee, son of the celebrated tabla player Anindyo Chatterjee. While we wait for the next year’s Puja, please let me know how you celebrated your Puja weekend. Share with us your thoughts on how to make this event even more enjoyable. This entry was posted in Arts-Culture, Generic, Social by sudipta. Bookmark the permalink. I got a little confused about what in the Kallol Pujo cultural program exactly met writer’s expectation. Did he know something which we didn’t to set his expectations on lowest common denominator? Admittedly, he argued; Friday was disappointing, Saturday was a disaster and Sunday had to be awkwardly stagemanged by a child; it still surpassed or met his expectations. Interesting observation. Even discounting the sound malfunction the play production was nothing to write home about. The selection of the play was ill-considered for the occasion. Moreover the director, the actors and stagehands, all seemed to have seen their prime. As a rule in this country the singers in their concerts perform only their published and already popular numbers and sometimes cover songs. The reason is obvious; live perfomance lets the audience participate and be involved. Selecting only her own songs might have given Suvomita a distinction and a point to make as she expressedly did in fact. Some of her song numbers may have been heard before by a handful of recent H1B’s, but not by the the vast majority of the audience here. She overlooked that she was not performing on a Calcutta podium. Her performance was technically superb, but dull and lifeless. Not tuning to the audience is a failing on the part of the performer, greatest she may have been. The ultimate responsibility for the lapse of judgment of course rests on the shoulders of the program organizers. Well, I did mention the events that were disappointing but the others were quite good. The good ones were good enough to make me enjoy the overall celebrations. After all, I do not expect to see best-in-class performances on a Puja stage where the performers have to accept to umpteen compromises. We need to realize that one cannot produce quality shows in a godown like hall with the worst acoustics and technical support. A Durga Puja cultural event is almost like a background entertainment that helps us to participate in our “adda” sessions as loud as possible. To watch and enjoy quality theater or music I would go to the proper venues. It is unfortunate that you found Subhomita’s music lifeless and dull. She obviously did not sing the golden oldies and that may have been the reason why she failed to connect to many. When we hear something new, it deserves some extra attention, which again is not possible in a Durga Puja environment and at a venue where nothing can be heard after the fourth row. I still applaud the organizers for having the courage to bring in the new generation of musicians and making us aware of the kind of music being created now in India and Bengal.